Gov. Dannel P. Malloy discusses options to widen Interstate 95 as DOT Commissioner James P. Redeker watches. 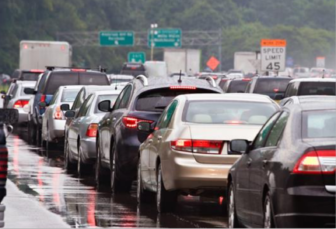 Connecticut could implement a “strategic and incremental” widening of Interstate 95 to relieve congestion along the state’s shoreline without having to take huge swaths of private property by eminent domain, a game-changer for breaking gridlock in Fairfield County, Gov. Dannel P. Malloy said Thursday. But the governor, who cited the results of a new Department of Transportation feasibility study, said the undertaking — which probably would cost more than $4 billion and take at least eight years to widen various sections of the highway — has no chance of proceeding until legislators stabilize Connecticut’s cash-starved Special Transportation Fund. A few minutes later, the governor put the obstacle that the state’s most congested traffic artery sets before economic growth in blunter terms. That congestion already has cost the state significant job growth in recent years — particularly in the high-paying financial services sector — as expanding New York City businesses have chosen Westchester County and northern New Jersey over Fairfield County. Peak morning and evening congestion cause 54 million hours of delays per year, costing businesses $1.2 billion annually. The governor resisted a suggestion that the project could be used to win support for tolls. Malloy, a former mayor of Stamford, said the new study sets aside previous assumptions that widening I-95 would be financially and politically impossible, due to the need to buy private land for a wider right of way. “My opinion is that was the news, not the ongoing discussion about how we’re going to replace gas taxes,” Malloy said. Adding one northbound lane between Exits 19 in Fairfield and Exit 28 in Bridgeport. Adding one southbound lane from Exit 7 in Stamford to the New York state line. And adding one northbound lane between Exit 9 in Stamford and Exit 19 in Fairfield. Traffic congestion on I-95 westbound. These measures, which would cost $2.3 billion collectively, would shave 22 minutes off the daily commute from the New York border to Bridgeport, and return $5 billion to the economy. More importantly, Redeker said, they could be accomplished chiefly by relying on property the state already owns or holds a right-of-way over, sparing the enormous cost of taking the property using eminent domain. While I-95 is a north-south highway running from Maine to Florida, it is an east-west path through Connecticut along coastal communities. Though congestion is not as severe on I-95 east of Fairfield County, the DOT is recommending road widening in strategic segments between: Branford and Old Saybrook; Old Lyme and East Lyme; and Waterford and New London. It also would redesign the junction of I-95 and Interstate 395 in Waterford. These projects would cost just under $1.9 billion in total. Redeker said most of this work would begin after 2022. 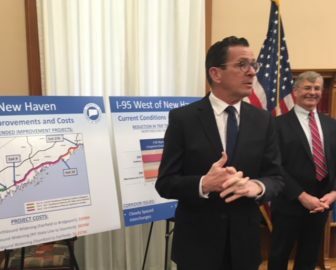 But Malloy said the combined pricetag for widening along all of I-95, about $4.2 billion, isn’t far beyond the reach of Connecticut’s existing transportation financing program. The administration warned Wall Street credit rating agencies, businesses and the legislature in late November that the new state budget short-changes the transportation program. Absent more funding, that program is headed for dramatic contraction over the next five years. The Special Transportation Fund, which holds about $1.51 billion this fiscal year, represents about 7 percent of the overall budget. It chiefly is used to cover debt payments on transportation-related borrowing and DOT operations. The administration says the existing transportation program is headed for a series of annual deficits starting with the fiscal year that begins July 1, and would reach insolvency by mid-2020. 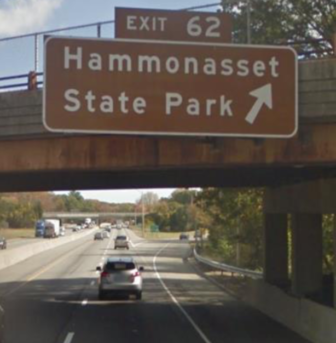 I-95 exit for Hammonasset State Park i Madison. Growth in gasoline tax receipts has been meager for much of the past decade, in part because of improving vehicle efficiency. Meanwhile, debt costs on transportation bonds –involving both outstanding debt and anticipated borrowing in the next few years — are not slowing down as Connecticut tries to reverse decades of deferred maintenance and other infrastructure investment. Debt costs alone are projected to jump 38 percent over the next three years combined — and 73 percent over the next five. The governor and Redeker announced in early January that more than 400 projects, and about $4.3 billion in capital spending planned for the next five years, are effectively suspended unless the transportation fund is replenished. These projects include some major highway rebuilds including: the elevated section of Interstate 84 in Hartford and the “mixmaster” junction of I-84 and Route 8 in Waterbury. Most of the spending involved with the proposed widening for I-95 is not part of the $4.3 billion, and would be an added expense. Last month the governor asked lawmakers to approve phasing a seven-cent increase onto the 25-cents-per-gallon retail gasoline tax over the next four years, and establishing electronic tolling on highways by 2022. Though some Democratic legislators have applauded the governor’s proposals, most have been silent. Republicans largely have been critical of the plan.